Is Your Current Insurance Policy Right for You? Looking to buy or sell a home in San Diego County? Click here to perform a full home search, or if you're thinking of selling your home, click here for a FREE Home Price Evaluation so you know what buyers will pay for your home in today's market. You may also call us at (858) 386-4478 for a FREE home buying or selling consultation to answer your real estate questions. Recently, we were going through a client's existing insurance coverage, and found there were a number of holes leaving the client severely under-covered and exposed to unnecessary liability. So, today we have invited our preferred insurance agent, Seth Arruda, from the Morgan Hege Insurance Agency, to come and talk a little about that particular client, and how they were able to help him get more coverage with the same rate. As they were looking at a comprehensive review of all of our client's policies, Seth noticed that his current home liability was $300,000, but his auto policy only had $25,000 of coverage if he were to get into an accident that was his fault. That limit is simply not enough to protect yourself in case of an accident. What Seth did was try to bundle all his policies under one roof to offer more protection. They were then able to offer him the same $300,000 home liability, but with an auto policy with $100,000 of coverage. This will provide him with much more protection, for the same rate. Keep in mind this is just one case study we are looking at. Every individual case is different, but the one constant with Seth and Morgan Hege Insurance is that they are always able to find either a gap in your coverage or take a look at all your comprehensive policies to maximize your protection. 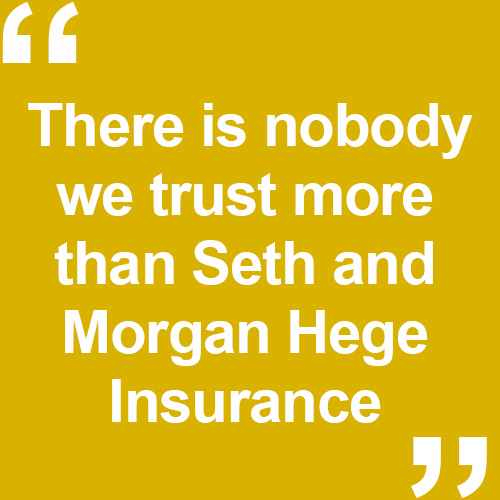 There is nobody we trust more than Seth and Morgan Hege Insurance. If you have any questions about your current insurance policy and how we can help you get more coverage for the same rate, give us a call. We'd be happy to help you out and get you in touch with the right people.